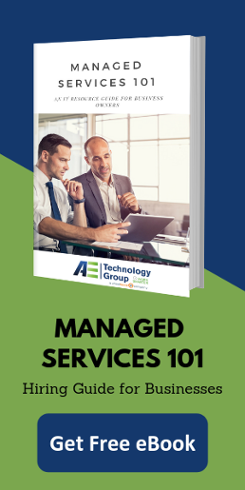 In Need of Managed Services for Your Doctor's Office? No business person is immune from it. Every professional has that moment when their printers are down, or their server is running slow, or their computer screen is frozen. What can you do about it if you are a busy doctor with a full patient load? You can’t let you technology slow you down. That is why you should consider managed services for doctor’s offices. AE Technology Group is a tech support group that specializes in providing IT support for small to medium size businesses in Long Island and New York City. But we also understand what IT needs you have that are specific to a medical practice. First and foremost, your patient’s security is our number one priority. We want to make sure all of your information is stored in a way that is compliant with HIPAA. We can test your office and give you recommendations on how to improve your practice so you would pass a HIPAA audit with flying colors. We also can provide you with secure email capabilities that allow you to share information with other providers and with your patients via email, but not with other people on the Internet. We understand that you need all of your technology working all the time. We run 24/7 proactive monitoring to catch as many issues as we can ahead of time. This minimizes any wasted time due to slow computers, printer disasters, and server crashes. Contact us at AE Technology Group for more information on how we can help your doctor’s office run with the most efficiency when it comes to technology. We understand your patients are counting on you, and we want you to be able to count on us.